A spot on likeness, speed and gripping entertainment is why David G is one of the most sought after caricaturists around. 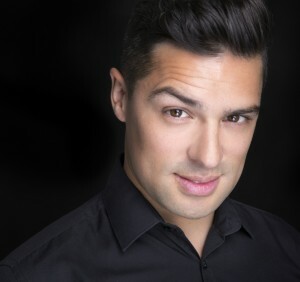 David G is available and ideal for weddings, and birthday parties, to trade shows, conferences and corporate gatherings and much much more, captivating your guests or clients and adding a touch of fun with hoots of laughter. 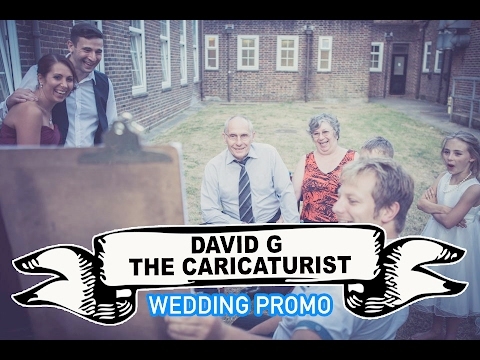 Check out the videos to see David G in action entertaining guests over those wedding lulls. In just a few minutes David G is perfect at capturing laughable yet distinctly recognisable caricatures of yours guests. He will put your friends at ease and they will have a unique original artwork to keep and treasure. Non-offensive (unless requested). No age limit! And everyone is suitable to be drawn. Number of Reviews and Counting... 107! David G draws between 10-14 caricatures an hour on A3 paper. With a mixture of silly bodies, head and shoulders poses and requests, capturing great likeness and real expressions. 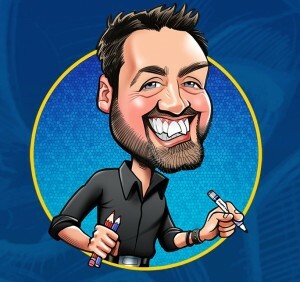 David G has caricatured for many blue chip companies and at premium venues over the last few years and caricatured at a vast variety of different types of events and is very much able to tailor his service to best serve your celebration. Check out the videos to see David G in action entertaining guests over those wedding lulls, and see references to see what others are saying about him. David G can mix and mingle or be situated in one place. 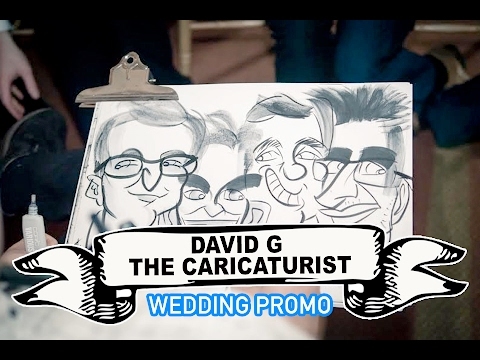 Either table hopping at weddings or being a walkabout caricaturist at award ceremonies, David can do whatever is best to best suit your engagement. 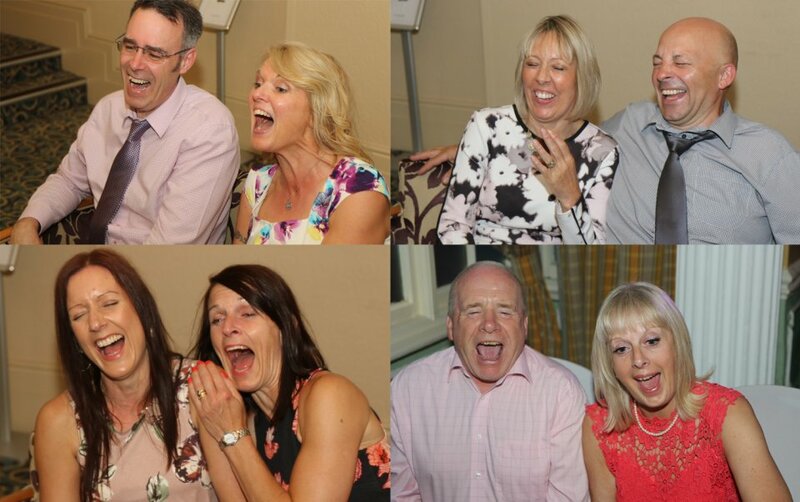 From connecting clients and engaging consumers at your trade stands, as opposed to an ice breaker with family and friends chatting at the wedding breakfast, right through to a blast of laughter at a 50th birthday party. David G offers great fun and continues this passion and personal undertaking to help others see themselves differently, one smile at a time. 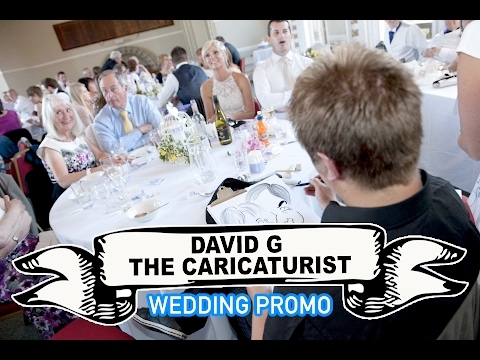 What better way to liven up your event with David G the Caricaturist. Brilliant, amazing pictures. Very happy bride and groom. He was brilliant!! I loved all his art work, he flowed around the room and even waited for us to draw us before leaving that night. Another great thing is that he took some pictures of guests with their drawings and later sent them onto us, a lovely touch! Definitely recommending him in the future! David G was brilliant, professional and funny. Everyone loved him! Thank you for making it a great evening! David was very personable and interacted with all our guests in a friendly manner. We were impressed with his drawings and we had many comments from guests saying he was an excellent addition to our evening entertainment. Thank you! Fantastic! Really amazing artist who was great with our guests. One of the talking points for our party! Excellent. David is friendly and fun and was a great addition to our evening. Guests loved their 'souvenirs' of the evening. David was a brilliant addition to our day! 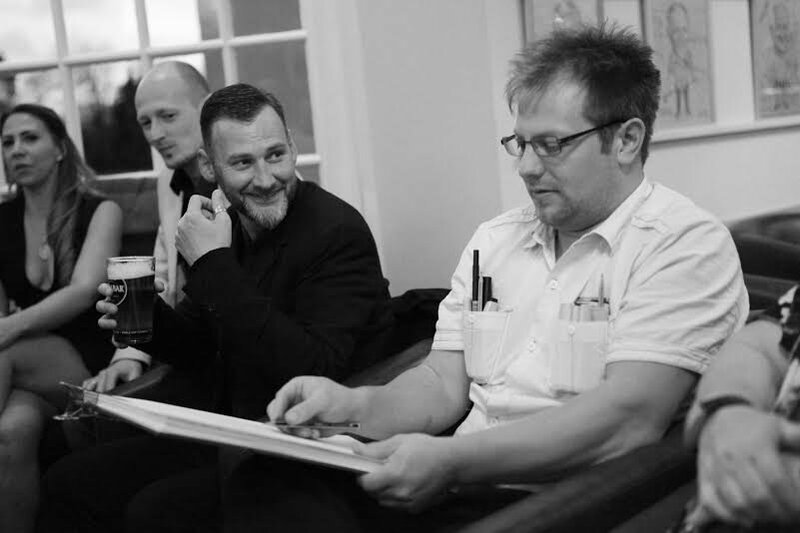 He put all the guests at ease and kept them entertained, while producing amazing and funny caricatures. We just wanted to say a huge thank you for doing such a fab job drawing our guests on Saturday evening at Gem and Sam's wedding! It provided so much fun and conversation amongst us all and you worked so hard throughout the evening so many, many thanks! Lovely chap, prompt, easy going and the delegates loved his drawings, they went down a treat! The booking process was easy and quick. I received updates nearer the event day to confirm everything was still ok. David was fantastic! His pictures are brilliant and all our guests were thrilled with their caricatures. There was a queue at one point with everyone wanting to have themselves drawn! David was lovely and made everyone feel very at ease, I cannot recommend him highly enough! Great to have him back for another year. David was amazing on the night. Not only did he create great pictures but also interacted with the crowd really well. Cannot speak any more highly of his contributions to making our evening a wonderful one. Would highly recommend and definitely use him again. Everyone loved it! Great guy, very quick on the draw and mingled with everyone no problems. Thank you so much. David was amazing. So talented, every caricature was brilliant. I can't recommend him enough! David was an excellent addition to our riverboat evening. His pictures were amazing and highly amusing. Very talented and would definitely book him again! 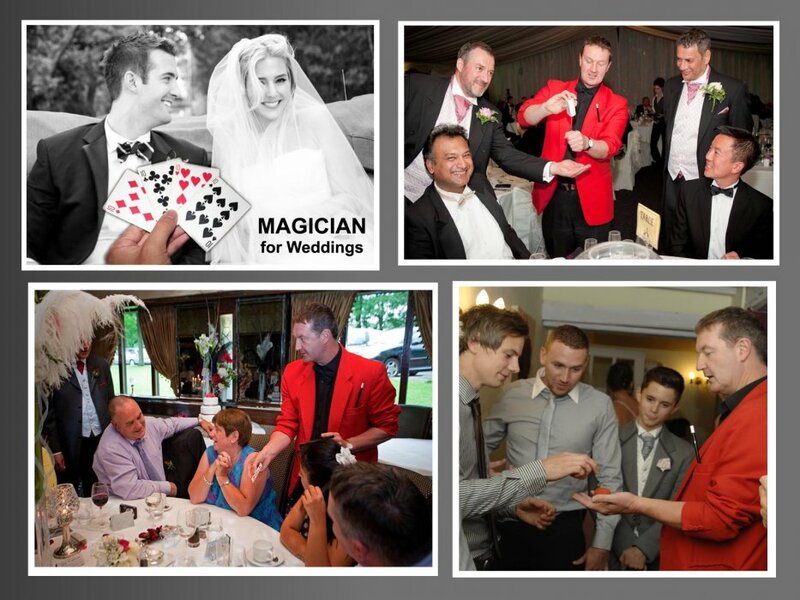 I have used Warble Entertainment a number of times now and they always provide a faultless service. David was a great success at our Corporate event, setting to work on caricatures of our guests and working tirelessly from start to finish. 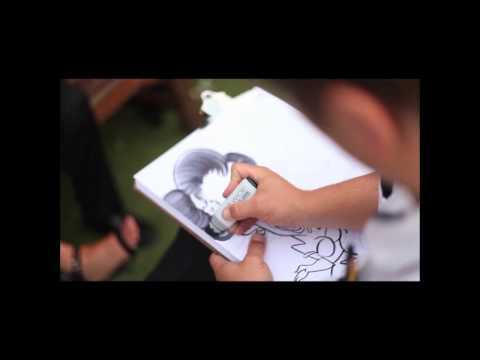 He produced some amazing work and his calm and professional manner encouraged guests to relax whilst he worked on their caricatures with often hilarious results. David is truly talented and I have no hesitation in recommending him. Amazing! Guests loved him and the pictures. Very personable and great artist! Highly recommended. Thank you! Very friendly and helpful, really helped make our event fun. Such a lovely guy! He got involved straight away and everyone loved his work. He was perfect for our awards night. Would highly recommend. Excellent service from yourselves and David G. Much appreciated by our guests, Thank you. Another cracking session with guests being from 6 months to 95 years old. Much hilarity alongside David's easy charm. Everyone loved the results of David's work. He is a very pleasant person, easy to talk to, and dealt with an overactive 8 year old extremely well and patiently! David was a wonderful and a very professional addition to our 60th birthday celebrations - friends and family, young and old and even the dog queued up for their portraits! I'd highly recommend him! David was a great addition to our stand at a recent exhibition we showcased our products at. 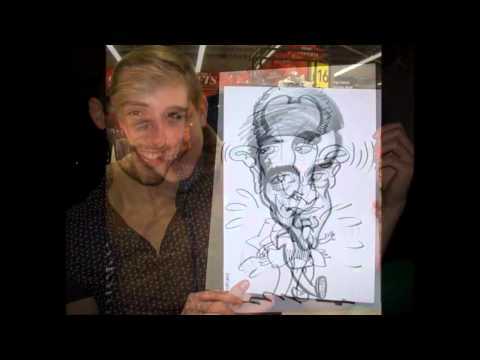 We asked him to create caricatures of people on our unique product CLINGZ - which was more difficult than paper! We will look at booking him again in the future. Brilliant, fun session - thank you! David G added excellent additional entertainment to our Company Charity Ball. David scribbled away all night and everyone was delighted with their portrait. I will have no hesitation in using David again at a future event as this was a big hit with all those who came across him. He is a super talented caricaturist and just wished we had booked him for a few hours more as many missed out! Thank you David G and look forward to seeing you again in the future. David was a fantastic part of our evening. His caricatures were popular with everyone! Thank you David! David was fantastic! We are so pleased we booked him for our wedding, the guests loved him and the drawings! Thank you so much for being a part of our special day and doing such a fab job! Such a friendly guy - he made everyone feel extremely comfortable and relaxed. Many memories made and taken away by guests. Prompt and polite and great with all ages! Couldn't be happier with this experience and would certainly recommend to anyone. David G was fab! He arrived on time, made everyone laugh with his hilarious caricatures and is a very likeable person! I'm so glad we chose you to provide entertainment at our wedding! Was very good and very professional have re-booked David G for a work's Christmas party. Arrived in plenty of time and interacted with our clients really well, and did fantastic drawings! David was great and everyone seemed delighted with the drawings so I was really pleased! The whole booking process was extremely efficient and worked really well. I am hoping 5 is the top mark as I couldn't fault anything! Thanks Gill. 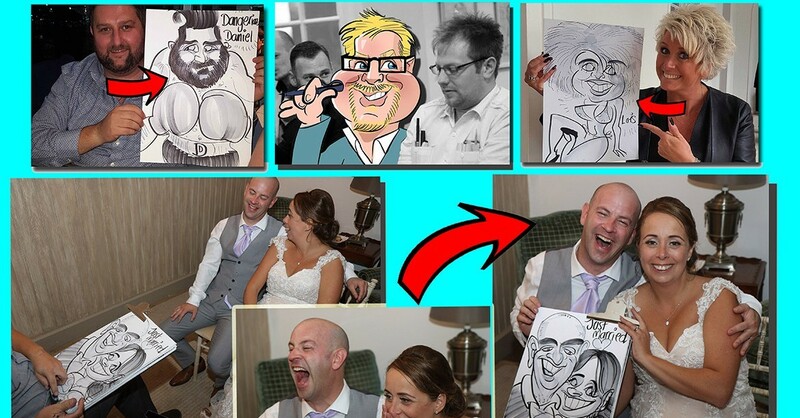 I would just like to say first of all thank you to Nicola Edge who first dealt with our enquiry regarding hiring a caricaturist for our wedding who was absolutely fantastic to give me a quick response and very helpful! David himself was so amazing with our guests, that there was actually a queue and extra requests from our guests to do their drawings! He was kind enough to stay a little longer too, even when his time was up. So I really appreciate this David! Your incredibly talented and so friendly and everyone absolutely loved you! I would recommend Warble Entertainment and David G 100%!! 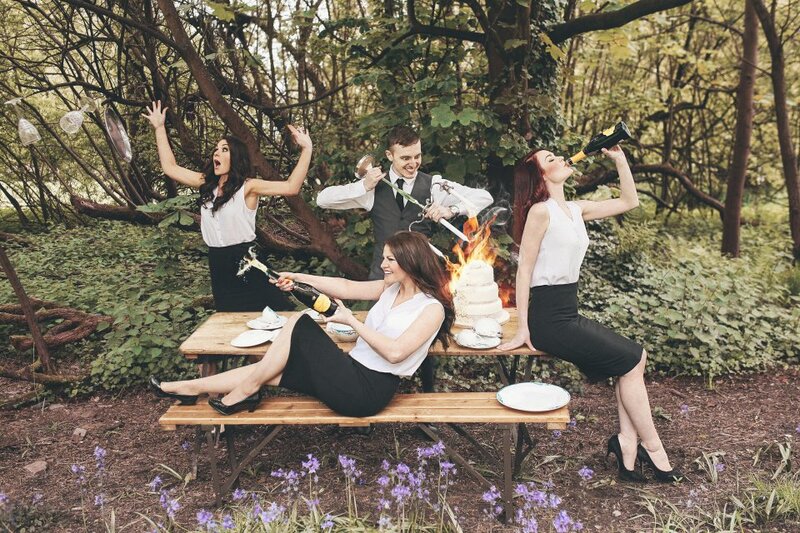 A brilliant addition to our wedding reception, laid back and great fun. Everyone went away with their own Cartoon drawn especially for them. Definitely beats having a photo booth or similar. Excellent stuff, thanks David. David was great! He was chatty, easy going and really captured the personalities of my guests! Everyone loved their pictures! David was friendly and professional and our guests thoroughly enjoyed his work. Fabulous! 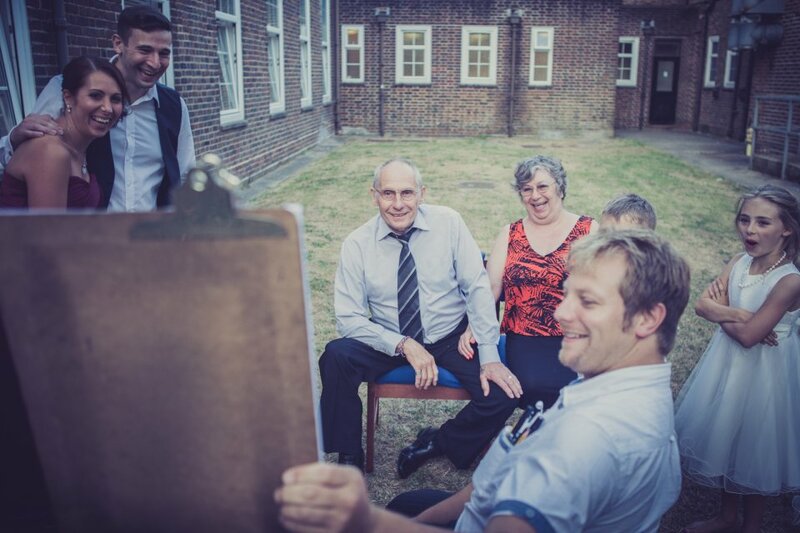 Our wedding guests were really excited and pleased with Dave and his drawings! So many guests so little time! Would definitely recommend him. Thank you. A great addition to our evening. Very nice young man who mixed well with my guests. Very personable and friendly. Turned up early to set up and interacted with our guests as soon as he arrived. Everyone loved their caricatures. Would book him again! David was great! He was kept very busy all night and was definitely a highlight of the reception! Everyone loved their drawings, and it was a great talking point post wedding! Many thanks for being part of our night. Absolutely fantastic, arrived at the exact moment we needed. If only I could have had David there all day the amount of people that wanted to have theirs done. Everyone who had theirs done was so impressed and it made a great taking point for the wedding guests. I only briefly got to see him as my grooms duty took over, but every time I looked round he was with more willing volunteers who said he was great at interacting with them and a good laugh! I would recommend David to anyone and your company for organising it, it has been effortless. Thank you so much! 10/10! Really liked David – very personable and good drawings too. David was a pleasure to work with. He was very professional, friendly and entertaining. Our guests had a lot of fun. Absolutely fantastic good fun and great pictures. David was fantastic and helped make our evening reception a great success for everyone! Everybody loved having their caricature done and it was brilliant watching how quick David created a new face in such quick time! We would recommend him highly! David was amazing! Everyone loved the pictures! He was welcoming and easy to get along with. All of our friends and family went home very happy! Thank you! The guests loved it... Thank you very much! David is so talented and everyone at the wedding loved his drawings. Would recommend to friends and family for further events. David was very pleasant and easy to talk to. His pictures were drawn to a high standard with most having a good likeness. Very nice chatty man and managed to get through a lot of pictures in 3 hours. I would recommend for a wedding or party as it went down a treat! David was great, very personable and easily slotted in around tables, making everyone feel relaxed while he was drawing. David was brilliant- He put people who were nervous at ease and provided some of us with great souvenirs. Was amazing with our guests and made for some fantastic entertainment. Absolutely brilliant. He didn't stop and everyone loved their pictures. David was just brilliant! I'm so glad that we booked him - he added something extra special to our party. He was very friendly and we kept him busy all afternoon - he even stayed slightly longer to make sure that everyone who wanted a drawing got one. Highly recommended! David was brilliant. Made everyone feel relaxed! Pictures were awesome. So glad I made the decision to choose him. Thank you. We had a work dinner to thank all the staff for their hard work over the past 6 months and decided to get some entertainment for the evening. I found Warble Entertainment through Google and I was sent through lots of options of different caricaturists that were available. Joanne was brilliant and really helpful so again 5/5 for your service. As for David G - He was absolutely brilliant. He arrived on time and was pleasant and helpful. His drawing were fantastic and gave everyone a great laugh. He really made the night and from all of us at WMT thank you very much. We wouldn't hesitate recommending him to anyone. Thanks again. From the very start Warble Entertainment have been both professional and quick to respond to all my questions. The booking process was very simple and easy to use. David contacted me a couple of days prior to the wedding to finalise the booking and arrived in plenty of time. Everyone was very complimentary about him. We would certainly recommend David as he was great fun. Fantastic caricaturist - didn't stop drawing from the minute he arrived until his departure. Would recommend David G for any event, he was amazing. David was really pleasant and friendly and his drawings were great! Everyone who had their caricatures done were really amazed by his drawings and he made the evening very entertaining and thoroughly enjoyable. We would recommend him to anyone - he was really great! Niki was such a pleasure to deal with! David G was excellent as well - very friendly, very eager and was great fun to have here on the bank holiday! 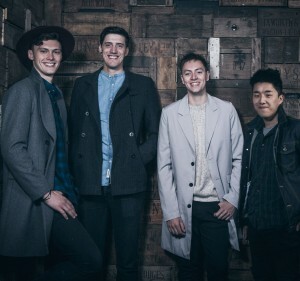 Will definitely be looking at Warble for any future event needs. Fantastic, all my guests loved it! Booking process was quick and easy. David G was faultless, wouldn't hesitate in booking him again, thank you. David really made my "Come Dine With Me" evening memorable! David was really nice and everyone enjoyed having themselves drawn. David was on time, extremely polite and was a hit with everyone. Clients were delighted and David was great on site. Thank you. Excellent, really happy with the pictures from David. David was great - he proved a big hit and ended up staying until midnight to keep up with demand! We have now got lots of great fun memories of our kids 21st birthday to share with everyone. David was brilliant! Very talented artist. The guests loved him and kept everyone entertained. The picture he did of us will go up on our wall, loved it! David was absolutely brilliant, we have some fabulous drawn memories to giggle over! Thanks for Saturday - everyone enjoyed the taking part and the watching of the creation of the caricatures. It created a great ice breaker and lots of fun which we are still enjoying! Such a lovely guy and was happy to stay until everyone who wanted a drawing had one. Very recommended. Amazing quality, really added to our day. We will use him again. Absolutely brilliant. Everyone was pleased with their caricature picture. David went above and beyond to make sure everyone that wanted a picture had one done. Have received amazing comments from my colleagues, David was a great part of a very successful party. Would definitely use Warble and David again. Thank you both very much. David was excellent. Punctual and professional. Everybody appreciated his approach and style and ability to blend in easily to the evening. Nobody knew he had been booked so his appearance was a huge surprise, which went down very well and every single person took their caricature home with them at the end of the evening. Would definitely recommend David to anybody if asked. Booking process was efficient and any questions were dealt with immediately. Thank you to David for attending my husbands birthday, he made it a memorable one with his amazing talent of recreating our guests as caricatures. I'm surprised he managed to get away as the queue for him was relentless! Thank you again, I'd recommend him highly and will be booking again in the future. David was very professional and very friendly to us and to our guests. He was very punctual and just got on straight away with pictures of are guests. His pictures were brilliant and he definitely took his time to make sure he captured everything he could about someone. I would definitely recommend him to anyone who wanted a caricaturist for any function and I would definitely use him again for any functions we do. Thank you so much David for making our day so fab. David was extremely fun and professional throughout the entire time he had been booked to perform at our wedding. The guests loved him and have expressed to us how much they enjoyed him. He worked extremely hard even staying longer than his performance time. Many thanks to him. Very friendly. Did loads of pictures, everyone liked him and his pictures. David wasn't intrusive on the wedding, but a lovely addition to the entertainment. Flexible, would recommend/use again. David was fantastic and extremely popular. Great with all and very funny. Would highly recommend David and would use his services again. David was great and very friendly. All our guests had a great fun time sitting for him! FANTASTIC!! The booking process was so easy to do. 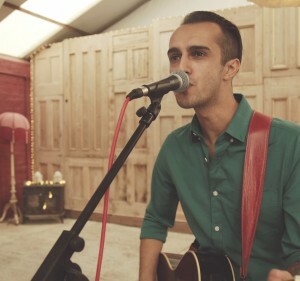 Booked for our wedding, David was brilliant. Arrived on time and was an instant hit. As the caricatures started to roll out into the guests, more and more people went to see him until they were queuing up to have their's done. Called to confirm the booking and talk through the details, and we really felt like he was a family friend... put us totally at ease and blended in with the friends and family at the event. Dressed smartly and very polite. On behalf of my wife and I, thank you so so much for coming to our reception, we hope you enjoyed it as much as we did! Book David G now.....!! David was fantastic. All the guests loved the drawings and the keepsake they got to take home. Would recommend David for any event. Such a lovely, genuine and charming guy. Helped to create a memorable event for all our friends and loved ones. David was one of the highlights of the evening with all the guests really complimentary of the service he offered. Also David worked until 11.30 which was longer than he should have which shows his passion and commitment to his work. I will will be passing your contact details onto our wedding venue in order for them to keep your details on file for future guests. Many thanks for all your help and we will be sure to recommend you to friends and family. David was absolutly fantastic, went above and beyond what was asked of him. Worked hard all night interacting with the guests and produced amazing drawings! I can't praise his professionalism and skill enough, would definitley hire again!!! Fabulous guy! Everyone loved getting their pictures done! It was the hit of the night!! We are going to get photos of everyones pictures and put together an album of our guests that way!! Thank you so much!! I can only say that David G was one of the highlights of a great night... David came a long way to the event. Was right on time and stayed almost to the end... certainly longer than we expected. Thank you David for adding something very different to my wifes 60th Surprise Party. Punctual and very friendly. Also very helpful in setting up his pitch. Miserable weather didn't dampen spirits and he was received very well by the crowd! Thank you! We were absolutley delighted with the service we recieved from David. He mingled so well with the guests and was so professional in his service. Our guests commented on what a nice guy he was and overall we are glad we booked him. He went out of his way to accomodate our plan for the day and for that we are truly grateful. Thank you. Hello there, well, what can I say. David was amazing on Saturday. People were queing up to have there pictures drawn. He was truely a professional and have recommended him to several of our friends. He looked smart and conducted himself very well. Will definitely be using him again in the future. David was great, he was very kind and did lots of drawings which our guests enjoyed. He was unobtrusive and seemed just right. I would recommend him. It’s possible to get a great likeness in a few strokes, however most people like their caricature with a little more detail and I draw a caricature every 4-5 minutes. That’s between 12-16 an hour and much depends on the circumstances and how well behaved guests are. Caricatures are on A3. Silly bodies as standard. Do you stay in one area, or move around? I can mix and mingle or be situated in one place. For example at weddings I am able to do table hopping and fit into gaps around the tables or quite often in the evening reception I can pull up a couple of chairs and position myself somewhere appropriate. I am very flexible and will work hard to make it work for your event. At corporate events and award ceremonies quite often is it more practical for me to stand up and draw and be a walkabout caricaturist. How many caricatures can you fit on a page? I can draw people on their own, and I often like to use the opportunity of single caricatures to make the bodies more comical. I can draw couples and friends together, and even small groups of three. What is your average performance times? I will draw as many as I can in the time allowed. However, it is an entertainment for onlookers to watch others being drawn and is about the buzz it can create. Can I do extra time? Absolutely. If I do not have another prior engagement or a place to be then that’s fine. Prices are negotiated on the day or before. Are your drawings free or do you charge per caricature? All drawings are completely free. You simply pay for my time. Guests should never have to pay for live entertainment. Only intentionally! Nah - In general I try and make the caricatures flattering. I don’t wish to upset anyone. However, every now and again, I can’t resist making it a more extreme exaggeration. Do you need to provide anything? No nothing at all, I’m self contained. The only thing you do need to consider is the lighting in your venue, as having adequate lighting makes a big difference. The most important thing is some fun-loving subjects. I love noting more better than a good banter with your guests and using my drawing skills for laughter and fun. Anywhere in the South East and beyond. I have pens and will travel. My style uses a brush marker pen for drawing and I use bold marker pens for the tone and shading. Are you up for new challenges? Absolutely. I recently caricatured at a Hen Party - on the top floor of a moving double decker bus that they hired! Needless to say that it was problematic but very entertaining. David can do 2, 3 and up to 4 hours straight and then his hand starts smoking! He can go on for longer with breaks. Customers who have enquired for David G the Caricaturist have also been interested in the following Caricaturists who are also available in West Sussex and the South East of England. For more information or further options, please call 0845 643 9384.